The Not Ready for Prime Time Bush Like Scott Walker, Jeb couldn’t rise to the demands of the national stage. We’ll begin with what went wrong with the Republican debate in Boulder, Colo., then look at what went wrong with Jeb Bush. 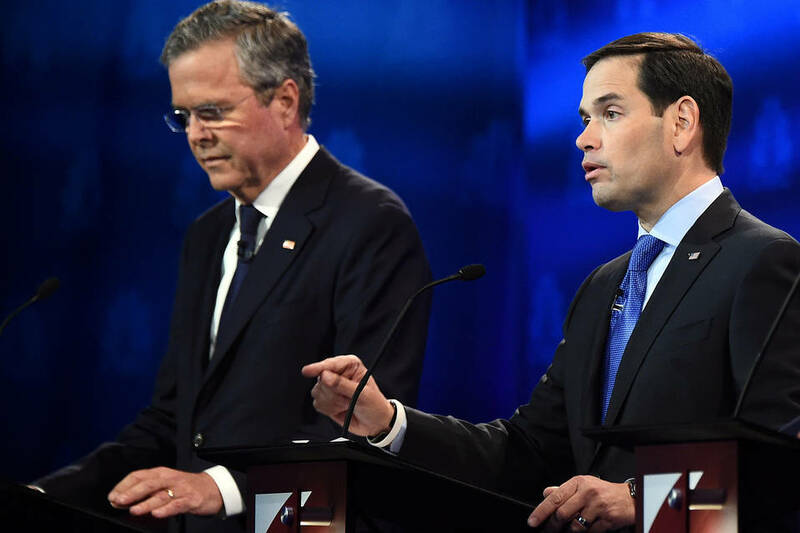 The worst of friends: Jeb Bush and Marco Rubio during the Republican presidential debate. There’s nothing wrong with mischief from debate moderators, but this was dumb mischief, plonkingly obvious in its ideological hostility. What’s your greatest weakness? Should fantasy football be regulated? These questions were merely shallow. Since Chris Christie has called climate change undeniable, asked Mr. Harwood, what would he do about it? Mr. Christie said his solutions would not be the usual Democratic ones involving more taxes and more power to Washington. “What should we do?” Mr. Harwood pressed. “You mean government?” Mr. Harwood interrupted. Pressed to answer the original question, Mr. Cruz said he’d be happy to. But Mr. Harwood turned to another candidate. “So you don’t want to hear the answer, John?” Mr. Cruz challenged. “You used your answer on something else,” said Mr. Harwood, curtly. I don’t know if fights like this win you anything, but the pushback was deserved, and instructive for future moderators: Be tough, incisive, follow up, dig down. But don’t be a high-handed snot, don’t wear your bias on your sleeve. That helps nothing. Don’t you get that? To Jeb. He has not succeeded this year, and there is no particular reason to believe he will. Yes, he still has money, but what has money got him so far? You could see almost all of what wasn’t working in his exchange with Marco Rubio, whom Jeb tried to zing in an obviously prepared attack on missed Senate votes. Mr. Rubio shut him down, just as Mr. Trump had in previous debates. It’s widely believed among high Jeb supporters that Mr. Trump—“The Gong Show,” as they call him—has kept Mr. Bush from rising. But Mr. Trump isn’t the problem, he was the revealer of the problem: Jeb just isn’t very good at this. He was playing from an old playbook—he means to show people his heart, hopes to run joyously. But it’s 2015, we’re in crisis; they don’t care about your heart and joy, they care about your brains, guts and toughness. The expectations he faced were unrealistically high. He was painted as the front-runner. Reporters thought with his record, and a brother and father as president, he must be the front-runner, the kind of guy the GOP would fall in line for. But there’s no falling in line this year. He spent his first months staking out his position not as a creative, original chief executive of a major state—which he was—but as a pol raising shock-and-awe money and giving listless, unfocused interviews in which he slouched and shrugged. There was a sense he was waiting to be appreciated. I speak of his candidacy in the past tense, which is rude though I don’t mean it rudely. It’s just hard to see how this can work. By hard I mean, for me, impossible.